Rembrandt Peale was born in 1778 in Bucks County, Pennsylvania, the second son of Charles Willson Peale. At the age of eight he began to draw. He painted his first portrait at the age of thirteen. 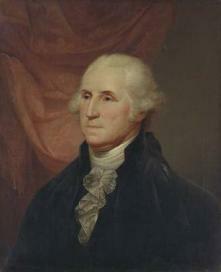 At the age of seventeen he painted the last portrait of George Washington to be done from life, although there is some ambiguity as to how much help he received from his father. He became a student at classes organized by his father and other Philadelphia artists and also studied the chemistry of pigments at the University of Pennsylvania's new medical school. In 1796, together with his brother Raphaelle, he established a museum in Baltimore, Maryland. He then assisted his father in unearthing and assembling the first complex skeleton of a mastodon ever found. In 1802 he visited London, studied under Benjamin West and exhibited at the Royal Academy the following year. In 1808 and 1809 he met with considerable success as a portraitist in Paris, where many celebrities sat for him. He returned to America in 1811 and attempted once more to establish the museum, which had failed in Baltimore in 1799. It was opened in 1814, and is now restored as the Municipal Museum of that city. Rembrandt continued to paint until his death, turning out occasional portraits and making copies of his original Washington. He served as President of the American Academy of Art. He died in 1860.